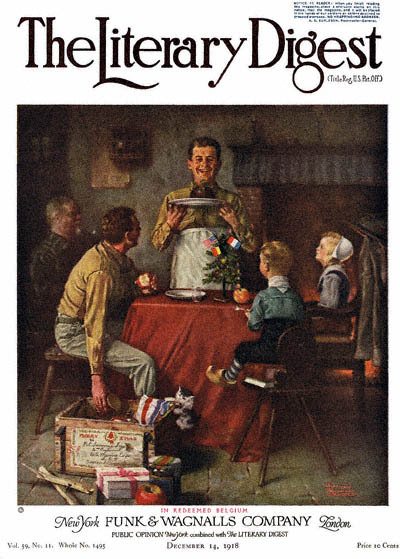 In Redeemed Belgium, this Norman Rockwell painting, appeared on the cover of The Literary Digest published December 14, 1918. The alternate title for this work is Soldier Dining in European Home. In Redeemed Belgium was Rockwell's third illustration appearing on The Literary Digest cover. By now, at age 20, he was already showing a good understanding of storytelling with a single picture. The Digest featured Rockwell on the cover three times in 1918. This scene shows Christmas dinner in 1918. In Redeemed Belgium was only one of 47 Norman Rockwell Literary Digest covers; here is the list of more Norman Rockwell Literary Digest scans. In October 1918, Germany requested a ceasefire and its allies rapidly followed. Though World War I was not officially over until seven months later, an air of peaceful optimism permeated the American consciousness. Norman Rockwell reflected this optimism in this picture. The painting shows two soldiers sharing their Christmas package with a Belgian family. We know it is Christmas time by both the December issue date and the Christmas tree on the table. The Christmas tree has United States, French and Belgian flags on it. Both the soldiers and the Belgian family have smiles on their faces. maybe Ted and Mary Jo would agree. it was bought in 1970 from a priest. it is located in mass.